(Phys.org)—A trio of researchers with the University of Nevada has found evidence that suggests bees have different taste preferences when it comes to pollen. In their paper published in the journal Biology Letters, Felicity Muth, Jacob Francis and Anne Leonard describe experiments they carried out with several bee colonies and what they learned by doing so. Everyone knows that bees visit flowers to collect nectar, which they bring back to their hive; less well known is that the pollen from the flowers that sticks to parts of their bodies (which is carried from flower to flower allowing for pollination) is also used by the bees as a food resource. Also, prior research has shown that flower color helps bees figure out which flower to visit, but now it appears they also rely on the taste of pollen in making their choice. The experiments conducted by the researchers involved filming the activities of six colonies of Bombus impatiens (the common eastern bumblebee) as they flitted from artificial flower to artificial flower, each fitted with an artificial anther and loaded with one of three different types of pollen: neutral cellulose, sweet sucrose or bitter quinine. The idea was to learn more about the preferences of the bees regarding taste—aroma was ruled out as a factor in choosing pollens by offering only pollens that were odorless. The researchers ran multiple trials, each approximately five minutes in duration, with bees that had been tagged to allow for tracking individual activities. As they filmed the bees, the researchers also recorded their body temperatures using thermal imaging. 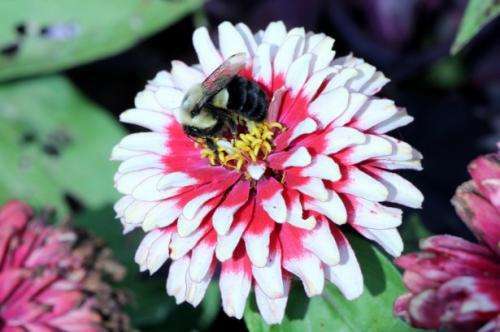 The team found that the bees spent approximately three times as much of their time collecting from the sucrose-covered anthers as they did from those covered in quinine, and 50 percent less time on those covered in cellulose. Still, the bees were persistent, and wound up collecting all the pollen that was available, though they tended to make return trips to flowers with sucrose as their first choice. Interestingly, it was the return trips during which the differences were noted, suggesting that the bees did not taste the pollen till they were in flight, or in some cases in the hive. Pollen plays a dual role as both a gametophyte and nutritional reward for pollinators. Although pollen chemistry varies across plant species, its functional significance in pollination has remained obscure, in part because little is known about how floral visitors assess it. Bees rely on pollen for protein, but whether foragers evaluate its chemistry is unclear, as it is primarily consumed by larvae.We asked whether the chemical composition of pollen influences bumblebees' foraging behaviour. Using putatively sweet and bitter pollen blends, we found that chemical composition influenced two aspects of bee behaviour relevant to plant fitness: the amount of pollen collected and the likelihood of subsequently visiting a visually similar flower. These findings offer a new perspective on the nutritional ecology of plant–pollinator interactions, as they show that pollen's taste may mediate its collection and transfer.